But would she let him in? Would Pauline Hanson let a five-year-old Sam Dastyari into Australia? It was a question that ignited a heated debate on Monday night's Q&A program, but Hanson became more intrigued with questioning the Labor Senator's faith than in answering it. "Are you a Muslim?" Hanson asked, for the third time. "Really? Gee Whiz... I'm surprised. I did not know that about you." Greens Senator Larissa Waters was quick to jump in. "Because he doesn't have three heads!?" Jokes aside, Hanson said she was "so happy" Dastyari came to Australia but claimed that situation had altered since Dastyari was five and the rise of Islamic-based terrorist attacks raised an imminent threat to Australians who now "live in fear". Dastyari was born in northern Iran and fled to Australia with his parents in 1988. "Ms Hanson, when you have a policy document that says in black and white, 'We should be banning Muslims from coming to this country,' I can't help but interpret what that means," Dastyari said. "Does that mean that a 5-year-old Sam Dastyari should never have been able to set foot in Australia because somewhere in Tehran there's a document that says beside my name the word "Muslim" because of where I was born? "For people like my family and the hundreds of thousands of migrants who have come from the Middle East and around the world, yes it is very personal." Dastyari and Hanson were joined by re-elected senators Nick Xenophon, Liberal Simon Birmingham and the Greens' Larissa Waters on Monday night discussing everything from the new senate to deradicalisation of Islamic extremism on home soil. "People in Australia are in fear because they can't walk in the streets, they're in fear of terrorism which is happening around the world. Why? Because of Islam. Because you have the radicalisation - radicalisation is actually happening in Australia," Hanson said. The Senator was confronted with more than 100 protesters in front of the studios before Q&A began, some gathering in her support while others counter-protesters gathered across the street holding placarding reading "Please explain" and "Stand with Muslims against racism". According to the Sydney Morning Herald, around six people were handcuffed and taken away when they appeared on the other side of Harris Street wearing dark clothes and scarves on their faces. It is understood that no charges will be made against them. However, Hanson stuck to her consistent blanket approach against all Muslims in Australia, even when confronted with impassioned and irate questions from Muslim Australians in the studio. 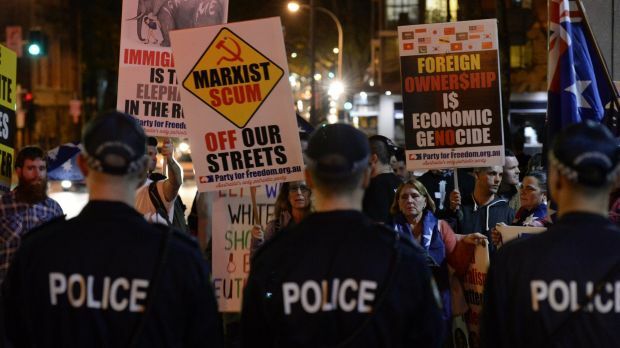 Protesters gathered outside the ABC buildings in Ultimo in the lead up to Q&A on Monday night. Cindy Rahal asked Hanson to "please explain" what constitutes a religion and a political ideology, to which the One Nation leader said "Islam does not separate itself from political ideology. "A lot of the countries that are ruled under Islam, it is the political ideology. I understand Islam does not believe in democracy, freedom of speech, freedom of assembly or freedom of the press." "We are a Christian country and I don't believe that Islam is compatible with our culture and our way of life and that's why we have problems in Australia on the streets and a lot of people are opposing the mosques that are built here." Rahal told Hanson she was not creating One Nation but "creating a divided nation". "If you want to have a look at creating one nation, you need to look at ways we can include everybody. All the Muslims and any other religion as well. You have a very one-track mind and unfortunately it is very dangerous," Rahal said. After defending her stance for the entirety of the program, Hanson wasn't so much relieved as stumped when another audience member, Mohammed, asked Hanson whether she would join his Muslim family for lunch -- which you can watch in all its glory here. Hanson initially said "that's a kind invitation" but then avoided accepting the invitation, eventually saying to call her office, but Sam Dastyari and Nick Xenophon stole her invite, Halal Snack Packs and all. And maybe the final word should go to Dastyari. "Twenty years ago it started off with blaming Indigenous Australians. Then it became about we're being swamped by Asians and now it's about blaming Muslims and the Muslim community," Dastyari said. "It is the politics of picking one section of our community -- pitting one section of our community against another section of our community, about simplifying complex problems and placing the blame on one group at one point in time. It is the politics of fear and division and, Ms Hanson, you're incredibly good at it."